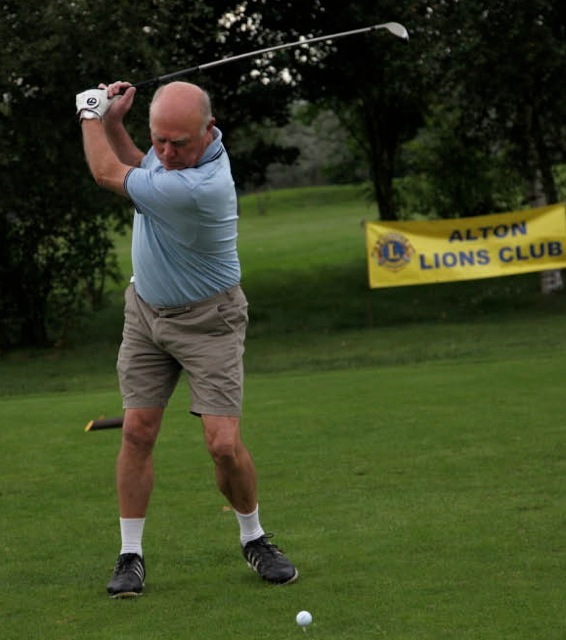 Alton Lions have completed their 40th year serving the local community since its charter in 1973 with a record performance in the Lions year 1st July 2012 to 30th June 2013. At the clubs celebration lunch Lion President Sarah O’Donoghue reminded members that at its first meeting the club initiated the ‘Christmas Gift’ project delivering a few gifts to some elderly people living alone in Alton. The club still delivers Christmas gifts, but on a rather larger scale, (in Alton and the surrounding villages), with well over 100 vouchers and gifts to elderly people and needy families delivered last year. 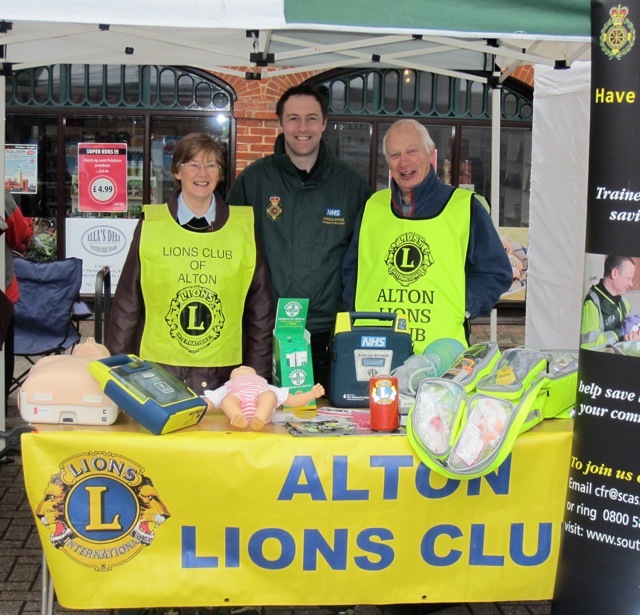 Sarah said that since the club was formed some 130 people from Alton have worn the Lions Badge and have taken part in the Lion’s motto ‘We Serve’. Club members have assisted the local community, and supported national and international Lions projects. However, we must not forget that nothing would have been possible without the support of the people of Alton and its surrounding villages and we are grateful of their continuing support. 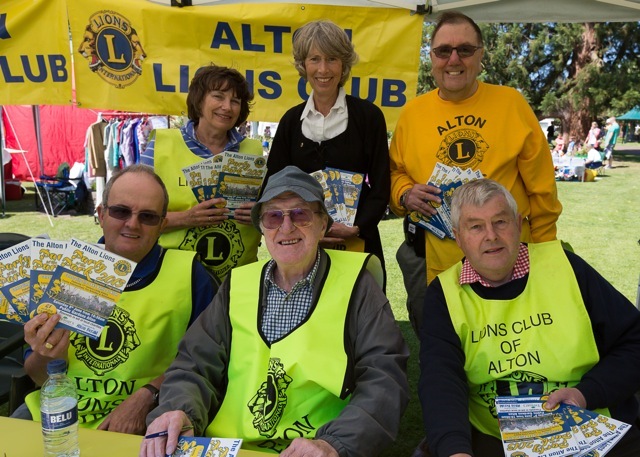 Alton Lions raises funds by organising events such as the Party in the Park, Golf Day, Road Races, Craft Markets, Easter Eggstavaganza, the annual house-to-house collection and others. 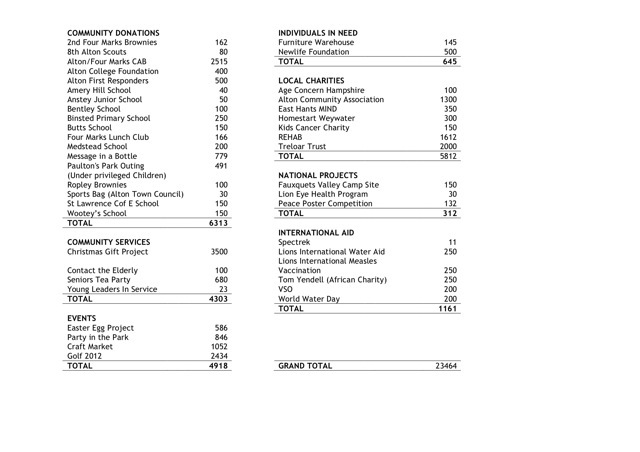 It not only distributes these funds mainly to local causes, but also organises and supports community activities such as the Christmas Gifts project, Seniors Tea Party, Lions Young Leaders in Service Awards, Message in a Bottle, the Paulton’s Park Trip for under privileged children, Contact the Elderly and many more. And last year, the club has been able to deliver over £23,000 back into the community in terms of donations to community projects, services, events, individuals, local charities and national and international Lions programmes. 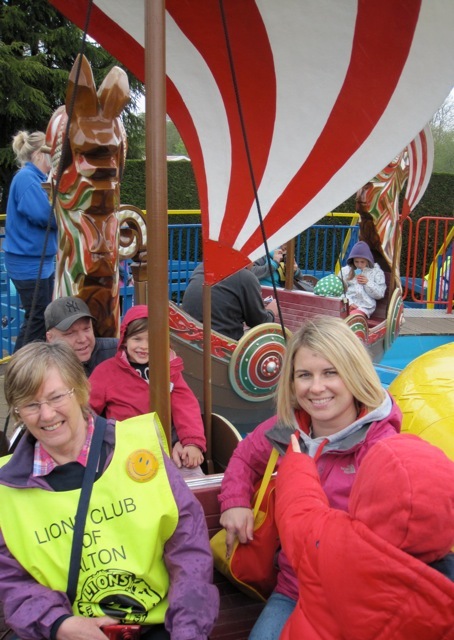 Sarah’s own knowledge of Alton Lions Club goes back just 6 years and she selected a few of the club’s activities over that time to mention. 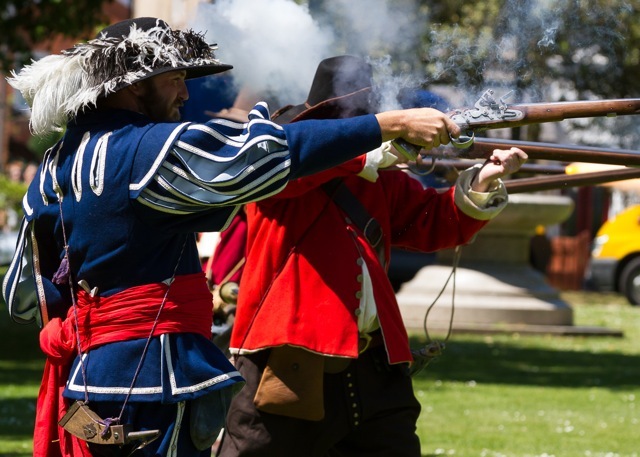 The club organises the Party in the Park in the Public Gardens every year in June in conjunction with Treloar’s School. This project, now in its sixth year, provided a great day out for the community and raised some £8000 (including the result of the month long raffle) for the disabled young people of Treloars whilst at the same time providing a venue for other local organisations to raise awareness and funds for their activities. The club, together with ‘Lyme Glass’, has been involved in staging the monthly Craft Market in Alton’s Market Square and Cross & Pillory Lane on Saturdays when the Farmer’s Market is in the High Street and have together become a regionally renowned event. 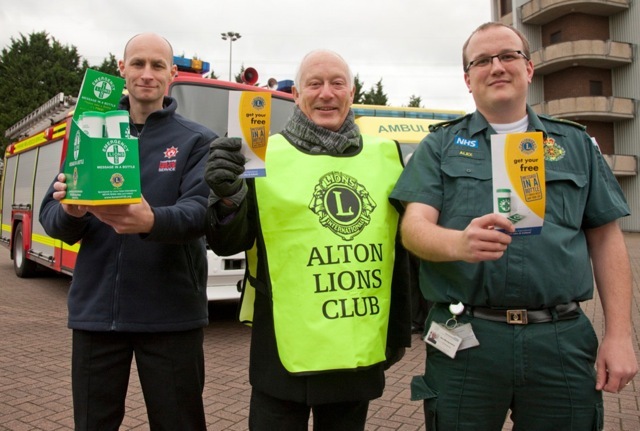 The co-operation with other organisations has increased and last year strong links were made with South Central Ambulance Service and with Hampshire Fire and Recue to ensure greater efficiency and awareness in the use of the ‘Message in a Bottle’ scheme. Co-operation with Alton College and their volunteering programme has resulted in 43 young people being awarded ‘Lion’s Young Leaders in Service Certificates’. This summer the Club will be co-operating with Rotary to fund a Youth Club at the Community Centre aimed at providing activities for young people at a loose end over the holiday period. Details of the beneficiaries of the last year’s efforts are attached together with some images of a great year. 9. 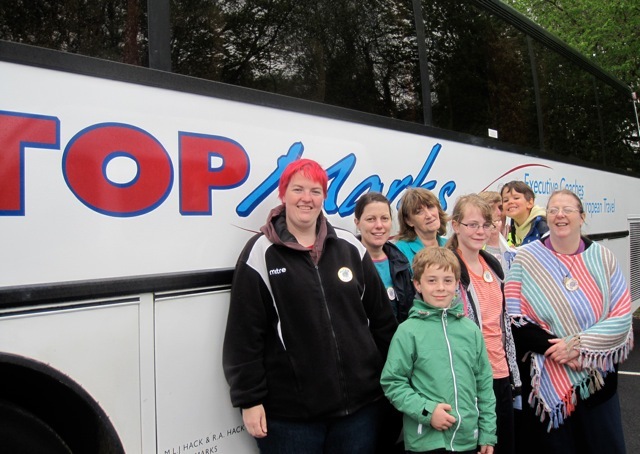 Paulton’s Park visit with the help of local coach firm TOP Marks.